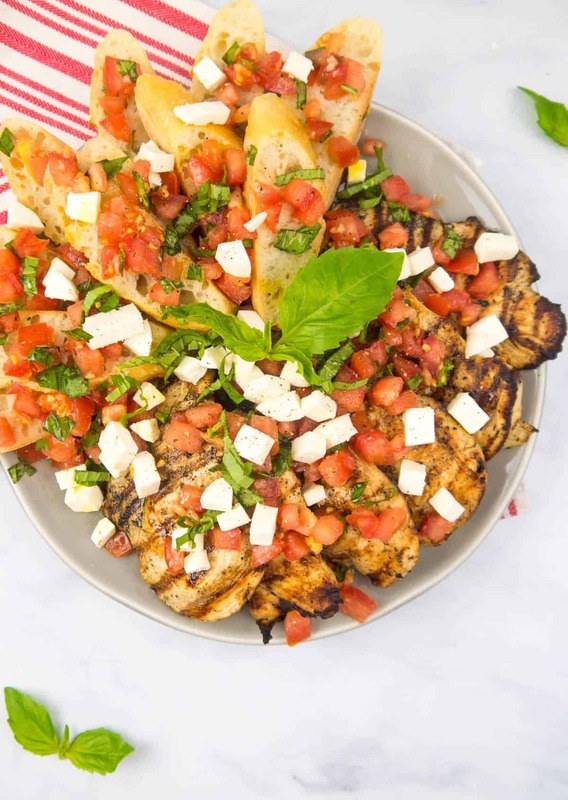 Warm summer nights call for one meal only: Grilled Bruschetta Chicken. It’s easy, delicious, requires barely any cooking or clean-up, and it tastes like pure summer. Basically the perfect weeknight dinner. 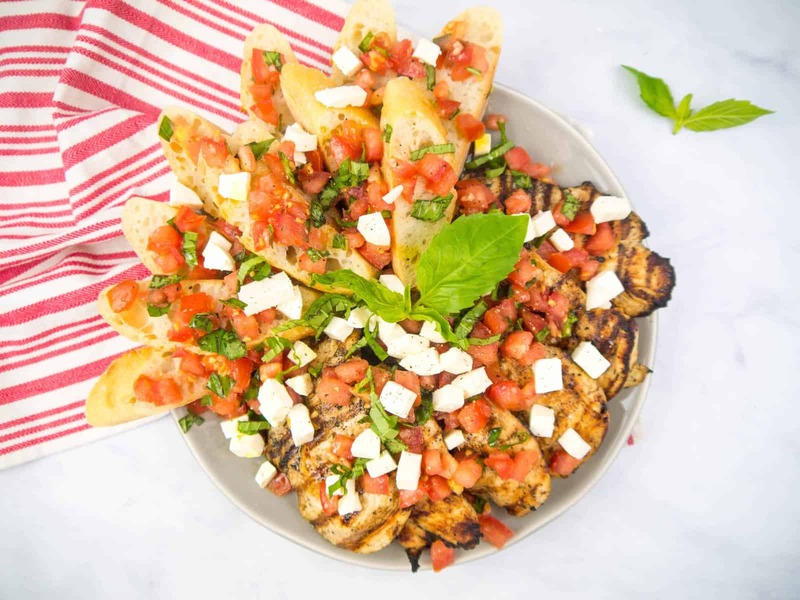 Bruschetta is an Italian appetizer of grilled bread rubbed with garlic, topped with olive oil and salt. Tomatoes are not required by definition, but that’s how it’s most well-known outside of Italy. 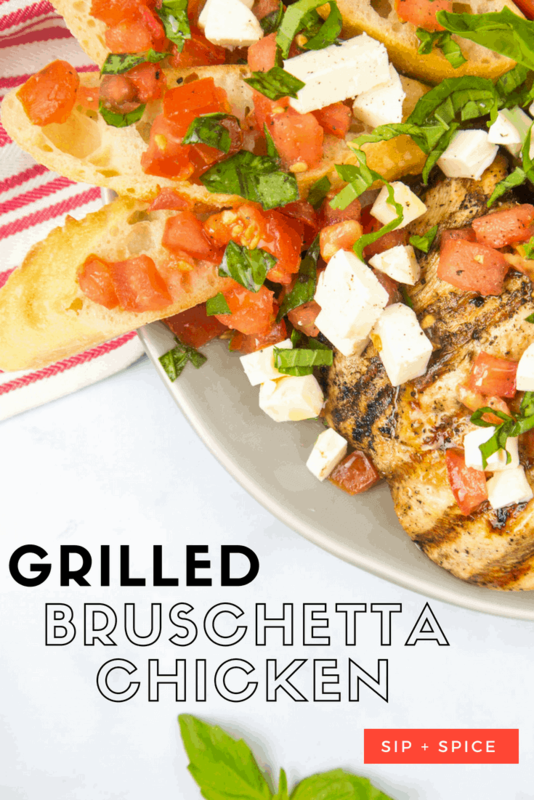 So when we call a dish “bruschetta chicken”, we better serve it with some toast! For authenticity of course! 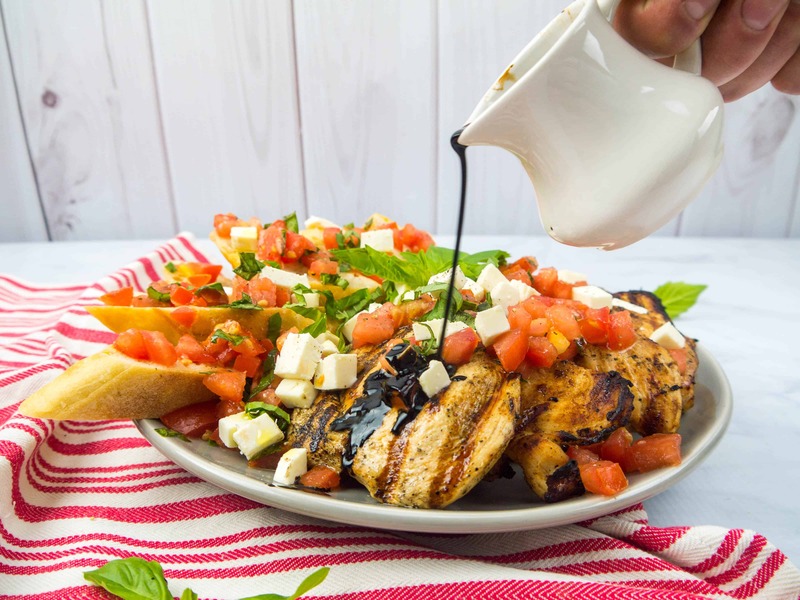 To keep this dinner simple, we grill the Italian-dressing marinated chicken and the bread, then serve it all on a platter topped with an abundance of tomatoes, mozzarella, torn basil and balsamic glaze. 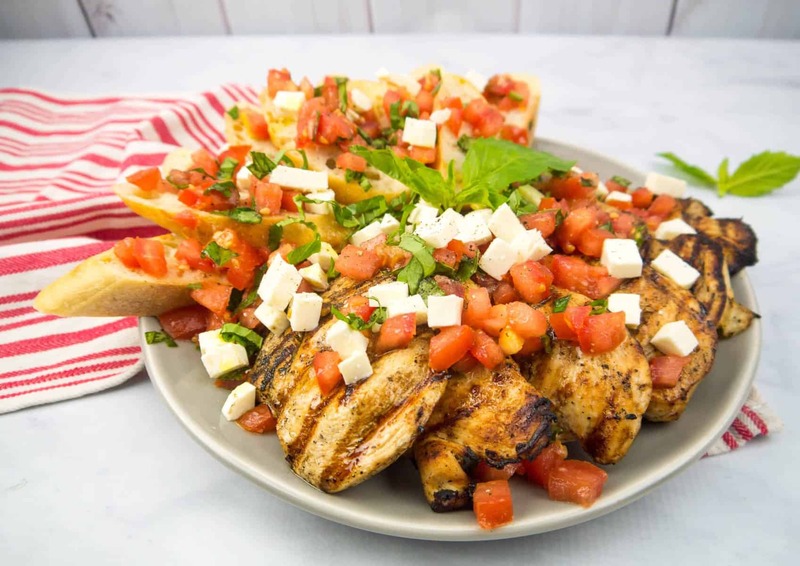 I’ll admit, we’ve been known to just eat plain old bruschetta (bread, tomatoes and olive oil) for dinner before, but when you serve it with chicken it really does turn it into a full meal. Make a quick side salad and you’re good to go! 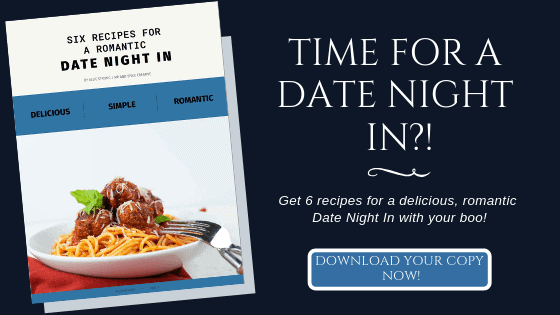 Grab a few plates, some napkins, gather everyone around the table, and dig in! Mangia! Slice chicken breasts in half width-wise (to create 4 total thin chicken breast halves. Place them in a baking dish or plastic bag with the Italian dressing. Let sit for 30 minutes to 6 hours. Wrap the sliced baguette in foil. Pour the balsamic vinegar into a small saucepan and heat over medium. Let simmer (just small bubbles) for 5 minutes, then turn off the heat and let thicken for an additional 10 minutes with the stove off. In a small bowl, mix together the diced tomato, torn basil, olive oil, salt and pepper. Let sit for 10 minutes. In the meantime, heat the grill and add the foil-wrapped bread to the top rack to warm up. Place the chicken breasts on the grill under the direct heat with tongs. Cook for about 5 minutes per side, until cooked through. Add the diced mozzarella to the tomato mixture and toss.